I’ve been watching Nigel Slater‘s (he really needs a new website) Simple Cooking on BBC lately. What actually made me watch it in the first place was the amazing title sequence. I want to bake something for the people who thought of having episode and recipe titles on food packages. So cute! What kept me watching are the really interesting recipes. Even though in every single episode I marvel at the miles he has to walk in his kitchen to get from the cupboard to the fridge or from the oven to the garden. Seriously, this must be the biggest kitchen ever. Episode 2 of the series is titled ‘Surf and Turf’ and he marries up a variety of foodstuffs with salt. Basically. Even though he does it with a lot more style than I am describing it. There is one recipe that I just had to try, Sea salt chocolate snaps and I managed to do it today (Friday afternoon being an amazingly relaxing time for me). Check out the recipe on the beeb and if interested here are a few lessons learned from yours truly. I think this is a kinda Learn From My Fail post. I think the most important thing here is to go for the chocolate that you absolutely love. I picked an over 70% cocoa solids chocolate bar which was way too bitter for my taste. My guy loved it, he prefers dark chocolate. I do too but not that bitter! So what I am saying is heed Nigel Slater when he mentions that you can use any chocolate you like and really do use that one. The recipe calls for a big pinch of sugar over the almonds but I found that it was not enough. About 2 tablespoons would be better methinks. However, this could just be me going for a bitter chocolate bar. More sugar on the flaked almonds might have balanced things out. When you spoon the chocolate onto the grease proof paper it is sooooo easy to underestimate how much chocolate you have there. For example each disk I made ended up being too thick after the chocolate set again. So don’t be afraid I think, the chocolate will not be too thin. Exactly because I underestimated the chocolate I didn’t add too many almonds and pistachios. They just looked… too many. However when the chocolate set again it was clear that the snaps could be a lot richer with more almonds and pistachios. So I think next time I will spread the melted chocolate a lot thinner and add a lot more of the crunchy goodies. OK fine I admit it I didn’t actually have big flaky sea salt. The reason being I totally forgot to get some. I’ve actually eaten chocolate with sea salt and it is surprisingly yummy. Oh well, next time. Because there will be a next time! Naturally all this is not to say that we didn’t eat too many of these wonderful treats. Quite the contrary. We’re still licking chocolate off the corners of our mouths. 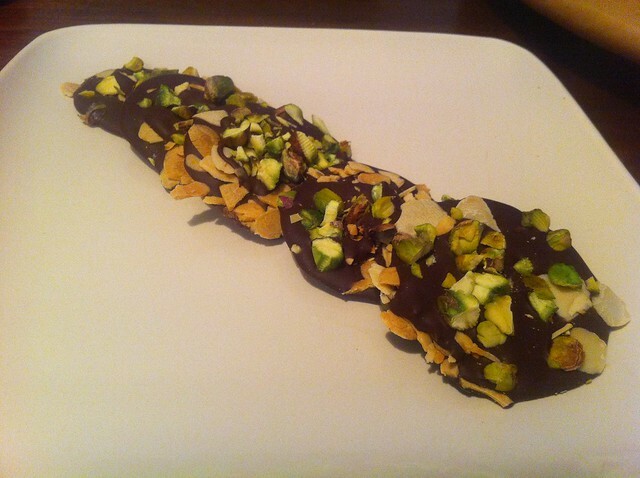 This entry was posted in Advice, Auntie Sofia, Auntie's food stuff, THE OMNIVORES, TIPS & EXPERIENCES and tagged advice, almonds, chocolate, LFMF, Nigel Slater, pistachios by auntie Sofia. Bookmark the permalink. Greek gal in London, learned to cook cause I wanted to eat pastitsio (it rocks). Next recipe to master: Anything from the Black Sea. Well done for trying it! I watched this episode and wasn’t convinced – but I love salt and I love chocolate – so seems like the ideal combination. Must try it. We mainly love GRUB, of the type that puts hair on your chest. Gourmet and cuisine are two words we just don't get.